For the third day in a row today, I was playing new courses in the mud. Or an inch or two of standing water. All while more rain was falling from the sky. It was only sprinkling at River Hill Park in Lexington, Kentucky, so I didn’t get TOO wet there! But on my back nine holes at Veterans Park DGC in Lexington, the skies opened up and I looked like a wet, dirty rat. View from the Hole 1 tee at Miller Park in Corbin, Kentucky. Two times I wound up flat on my back, slipping on some muddy hills. And by the time I made it back to my car after the round, my left sock was covered in blood. But the “T” in Tonn stands for tenacious (or sTupidity? Ha! 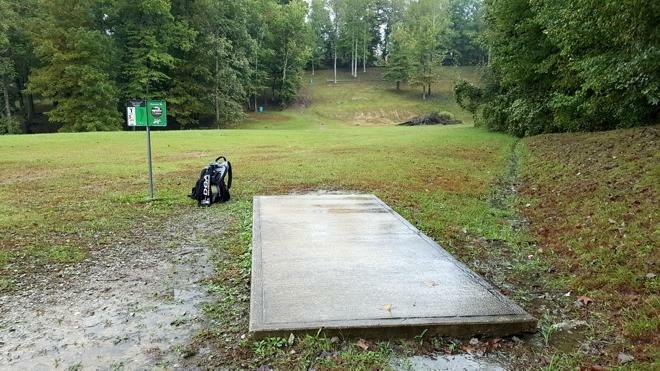 ), so I pressed on in the rain and mud…checking out a nine-hole course at Miller Park in Corbin, Kentucky, as well as what is left of a nine-hole course at Lincoln Memorial University in Harrogate, Tennessee. Feeling discouraged, demoralized, and defeated after three days, fourteen rounds, in the rain, mud and standing water, I needed a pick-me-up! And it was as if the “disc golf gods” decided to smile down upon me, with us seeing the first sunshine on the trip as we made our way toward Asheville, North Carolina and Sandhill NTDGC. View from the Hole 17 tee at Sandhill NTDGC in Asheville, North Carolina. After that enjoyable final round on the day, it was time for dinner and my hotel in Hendersonville, North Carolina. Fingers crossed for more sunshine tomorrow! 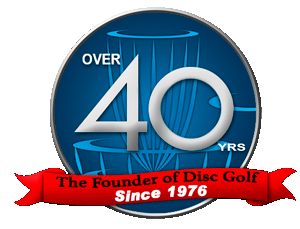 A main purpose of this blog will be to share information, helpful tips and tricks (everything from health and fitness to methods for saving money while you’re our “bagging courses” of your own), and ideas for better, safer course design. But I am also hoping to inspire others with my passion for the sport, via the stories I can share about all of the interesting experiences I have. All of the interesting people I meet. All of the amazing courses I am blessed to have the opportunity to play. If I can inspire even a handful of individuals to get off the couch, get “out of their bubble” or “security blanket” and explore more of this big, beautiful planet we all call home? Then I will consider this effort a success. 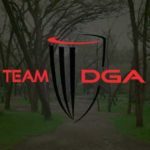 Derek Tonn is a member of the DGA’s Ambassador Team. 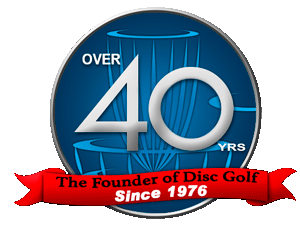 His company, Mapformation, LLC, has been DGA’s partner in the development of disc golf tee signage since 2012. The longer our two companies have worked together, and the more Derek has gotten to know all the great folks at DGA the more he has wanted to formally sing the company’s praises. 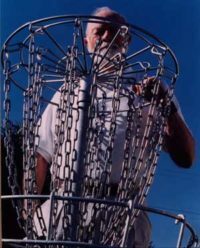 The more he has realized that “Steady” Ed the father of disc golf and the modern day Frisbee vision for the sport and his company perfectly describes his own interests and priorities related to disc golf, and the more Derek has recently been encouraged to share his story.